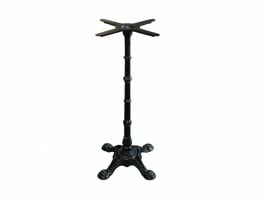 The Relax House Bistro Cast Iron bistro style decorative table base is one of the prettiest commercial table bases we sell. Not only does this vintage style restaurant table base look beautiful, its cast iron construction lends it a sturdiness you and your customers will appreciate. Our Calais cafe table base is durable enough for both indoor and outdoor use so put this pretty table base to work on your restaurant's terrace. 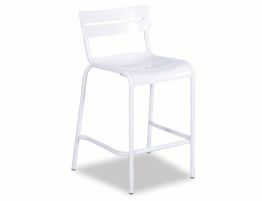 The Bistro commercial table base is compatible with an table top size up to 800mm diameter. 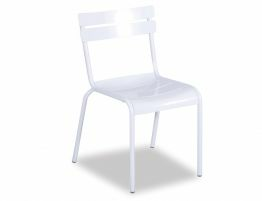 You can pair it with your current table tops or we also have a nice range of compatible table tops featured here. This highly decorative style offers high end good looks but the Calais is also a very malleable design. These bases would look elegant and vintage in your coffee house or your high end French restaurant. 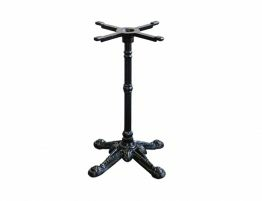 Our restaurant table bases would look equally as nice in your old world European bistro or your old school ice cream shop. The classic decorative style and cast iron construction makes these attractive bistro table bases impervious to changing trends and built to last and because they come separate from the table tops, you have endless options as to how you customize your own look. Likewise, tables tops can really take a beating from the heat, the wear & tear, the washing, so if your table tops wear out, you can keep these bases and just replace the table tops. Our Bistro Vintage antique style decorative table base is one of our favorites but we have many more from the more no nonsense table bases to twin table bases that can support some of the larger style table tops. 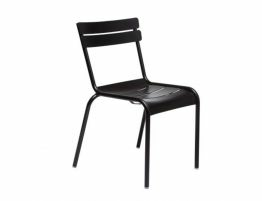 If you need restaurant furniture Sydney, we have got what you are looking for. From wrought iron table bases to modern table bases to wood table tops and more, Relax House offers our commercial furniture customers great choices for a redesign or new place.